Easter Sunday on April 24, 2011 - the theme of RESURRECTION and hope following the FAST for DARFUR. Language: Armenian & English. Main English sermon begins at 13:50 minutes. 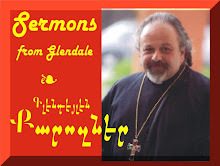 Sermon delivered at the St. Peter Armenian Church Youth Ministries' Center, Glendale, California by Fr. Vazken Movsesian.